Back in New York, Woody met and vigorously courted a young dancer with the Martha Graham Dance Company named Marjorie (Greenblatt) Mazia. Sharing humanist ideals and activist politics, Woody and Marjorie were married in 1945 and over the years had four children: Cathy, (who died at age four in a tragic home fire), Arlo, Joady, and Nora. This relationship provided Woody a level of domestic stability and encouragement which he had previously not known, enabling him to turn out a staggering number of original songs, writings, drawings, paintings, poems and prose pieces. His first novel, Bound for Glory, a semi-autobiographical account of his Dust Bowl years was published in 1943 to critical acclaim. During World War II, moved by his passion against Fascism, Woody served in both the Merchant Marine and the Army. Shipping out to sea on several occasions with his buddies Cisco Houston and Jimmy Longhi, Woody's tendency to write songs, tell stories and make drawings continued unabated. 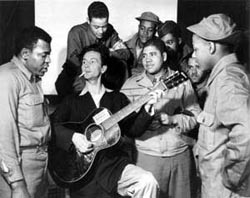 He composed hundreds of anti-Hitler, pro-war, and historic ballads to rally the troops, such as “All You Fascists Bound To Lose”, “Talking Merchant Marine,” and “The Sinking of the Reuben James.” He began to work on a second novel, Sea Porpoise, and was enlisted by the army to write songs about the dangers of venereal diseases, which were published in brochures distributed to sailors. His capacity for creative self-expression seemed inexhaustible, whether on land or sea.